The Hindu nationalist Rashtriya Swayamsevak Sangh (RSS) has laid out its stand on several issues expected to dominate Indian politics in the run-up to general elections due next year. 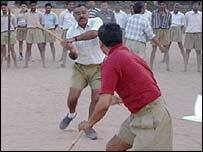 The RSS is the ideological fountainhead of various Hindu groups including India's governing Bharatiya Janata Party. Following a three-day conclave, it came out in strong support for the construction of a Hindu temple at Ayodhya, on the ruins of the demolished Babri mosque. It also passed a resolution on the controversial issue of Bangladeshi infiltration - like the BJP, the RSS believes that illegal Bengali Muslim migrants from across the border should be sent back. The RSS came into existence in 1925 in the western Indian city of Nagpur with an avowed objective to make India a Hindu nation. Today the organisation has around 4.5 million active members across India and over 100 affiliate bodies. 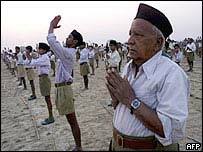 Some RSS members take part in military drills and exercises - a guiding principle of the organisation is that India should be Hinduised and militarised. Critics of the organisation say that its hardline ideology is based on intolerance towards religious minorities. RSS founder KS Hegdewar gave the organisation an ideological framework and developed it into a sizeable network throughout India. However, during his 15-year stewardship he consciously kept the organisation from having a direct affiliation with any of the political organisations then fighting British rule. The RSS grew in size when MS Golwarkar was nominated as successor to Mr Hedgewar in 1940. He steered the organisation through a difficult time, and remained in charge for 33 years. Mahatma Gandhi was assassinated in 1948 by a militant Hindu who had once been an RSS member. This incident, coupled with a subsequent ban on the organisation imposed by the government, undoubtedly blighted its image. Up until Mahatma Gandhi's murder, the RSS capitalised on the departure of millions of Muslims to the newly created Pakistan at the time of partition. The organisation used this mass Muslim migration as an opportunity to intensify its campaign for India to become a Hindu nation. The ban on the RSS was lifted in 1950 when it gave an undertaking that it would work under its own written constitution. Its drive to be at the centre of right-wing Hindu thinking was enhanced when its members played a key role in the launch of a new right-wing Hindu party, Janasangh, in October 1950. The new party mainly drew its support from Hindu refugees who had come from Pakistan. The majority party in India's current governing coalition, the BJP, was formed by many who were in the Janasangh party before it was disbanded. The BJP itself is considered a political off-shoot of the RSS. The RSS has been banned on two other occasions since 1948. Once in 1975, when Indira Gandhi was prime minister, and in 1993 because of its perceived role in the demolition of the 464-year-old mosque in the northern town of Ayodhya. Although the RSS claims to be a socio-cultural organisation without a political agenda, this has often been debated and challenged. The organisation was at the centre of the controversy that brought down the first ever non-Congress coalition government. Some constituents of the coalition accused the Hindu nationalist Jan Sangh of acting under orders of the RSS rather than in consultation with its coalition partners. Critics of the RSS maintain that India's current BJP-led government is also unduly influenced by the organisation. "The RSS is closely linked to the BJP, the party at the head of India's governing coalition"